I don’t pretend that today I am going to present to you the best app created for Android, app related to beer, but I will try to do this. The application that I have selected is named Pintley Beer Recommendations and let me tell you that I have selected it because of its name. I know that it is wrong to judge a book by its covers, as they say, but in some situations, the name attract the users. You probably know better than I do, because you were attracted to this article because of the title right? Anyway, the app is developed by The Pintley Company LLC and it is free. Watch out because it contains adult content. I must say that it is the first time when I hear about this company, but if they have created an application related to beer, they are one of my favorites. No, you don’t have to think that I like beer. I should explain this better; I was attracted to this application because it contains the word “recommendations” in the title and also because I believe that the beer and the wine really contain some substances that are good for your health, if they are consumed within certain limits, that is. Because if you start drinking beer or wine, thinking that they are doing just fine for your body, you may be wrong, if you exceed the limits. And a limit that is set for a person that has 50 kg, let’s say, is definitely not the limit for a person that has 42 kg. 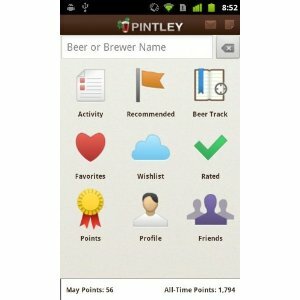 You can track a beer activity (this should be interesting), you can add a certain beer to your favorites, you can create a wishlist (this is definitely the most interesting feature of this application), you can rate some beers, create a profile for yourself, receive points, discuss with your friends and more other tasks. The problem with this application is that it recommends some products that may not be encountered in your country, if you’re not from the United States. For example, you may hear of some brands that are not familiar for you and this may get you confused, even before the beer does. As I can see, you can see what other friends like, if they use the same application; in other words if they like the X brewer, you can like it to and you can try his products. Just don’t tell your wife! Believe it or not, but this application is included in the Social Networking category on Amazon and it has been released on May 25, 2011.